Customers Master Files are used to identify your company’s Customers and track their purchases, returns, and accounts receivable history. To access Customers from the menu bar of the main TeleTracker Online screen, click Master Files, then Customers. To create a new Customer, click on New button located on the toolbar. To open an existing Customer, select the Customer from the Customer Master File list and click the Open button. Submit Credit : This button is used to access the Service Provider Credit Check website. Based upon the information entered into the customer Master File, TeleTracker Online will auto-fill the service provider website fields. Click the Submit Credit button. Select the appropriate Service Provider. Log in to the Service Provider credit check website. When you reach the appropriate customer credit check screen, follow the instructions and buttons at the top of the screen. To configure the Submit Credit button, visit the Service Provider General help page. Code : This field is the unique account number used to identify each individual customer. This field can be set to default as an automatically sequenced or manually entered number. Please refer to the Preferences feature within TeleTracker Online to define the parameters of this feature. Customer Type : This field can either be ‘Individual’ or ‘Business’. When Business is chosen, a company name must be entered. Status : When appropriate, apply a status code to the customer. See the Customer Status Master File help file for instructions on creating status codes. 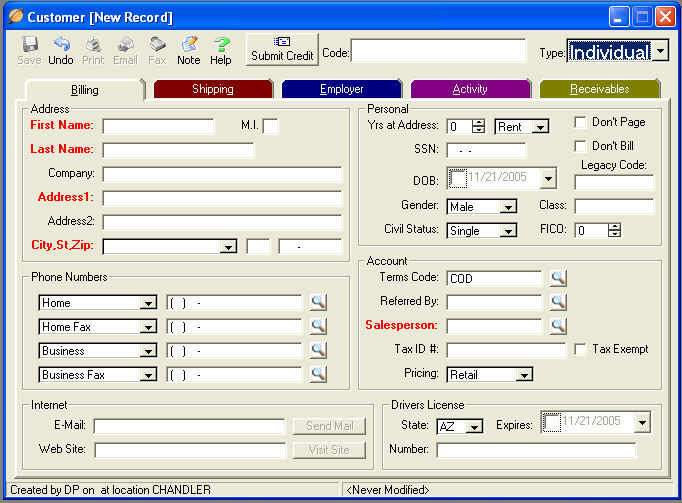 This TAB is designed to house the customer’s detailed contact and billing information. Address & Phone Numbers & Internet & Personal & Drivers License : Fill in the appropriate customer fields. Terms Code : This field is used to identify the customer’s individual payment terms. The information entered in this field automatically becomes the customer’s default payment term whenever an invoice is generated for the customer. Please refer to the Terms Master Files for further information regarding terms. Pricing : This field is used to identify the customer’s individual pricing level. The information entered in this field automatically becomes the customer’s default pricing whenever an invoice is generated for the customer. Please refer to the Products Master Files for further information regarding product pricing. Salesperson : This field is used to identify the customer’s original salesperson. This field can be set to default the original Salesperson to automatically populate the customer’s future invoices. Please refer to the Preferences feature within TeleTracker Online to define the parameters of this feature. 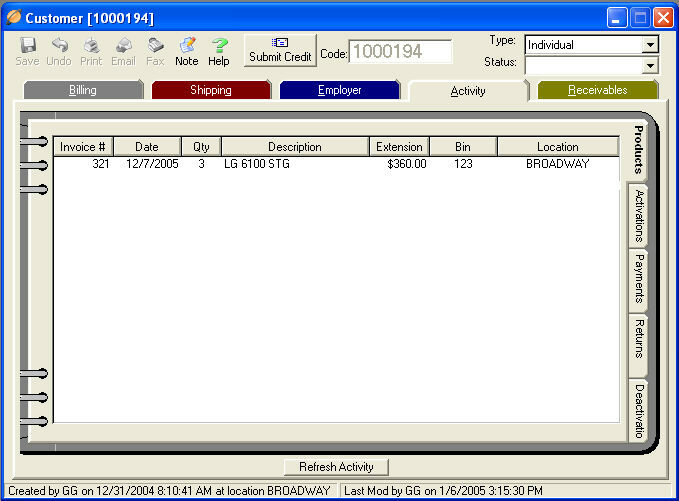 This TAB is designed to house the customer’s detailed shipping information. This TAB is designed to house the customer’s employment information. This TAB is designed to house the type of Activities associated with the customer. Within the Activity TAB are several TAB's designed to present different information associated with the selected customer. Products : This TAB displays a complete history of each product the customer has purchased. Activations : This TAB displays a complete history of each of the customer’s activation(s). Payments : This TAB displays a complete history of the customer’s payments. Returns : This TAB displays all of the customer’s returns. Deactivations : This TAB displays all of the customer’s deactivations. The detail of each transaction displayed in these tabs can be viewed by double clicking on the transaction. This TAB is designed to provide the customer’s outstanding, and/or past due transactions. The detail of each transaction can be viewed by double clicking on the transaction. You may also create new invoices, batch payments and/or returns from this tab by simply clicking on the New Invoice, New Batch Payment and New Return buttons located in the lower left-hand corner of this screen. Credit Limit : Assign the appropriate Credit Limit to the customer in this field. Note: In order for the credit limit to take effect, the appropriate term code must be applied to the invoice. Balance : This field shows the current balance due for the select customer.